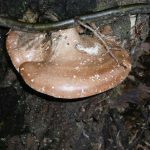 This polypore is quite an incredible fungus, well worth knowing how to identify it, and definitely worth harvesting for its health benefits (the usual rules of collection apply). The first time I was certain that this was what I was looking at, I was very excited and like most of these things, when you’ve positively identified it once, you see them all the time. 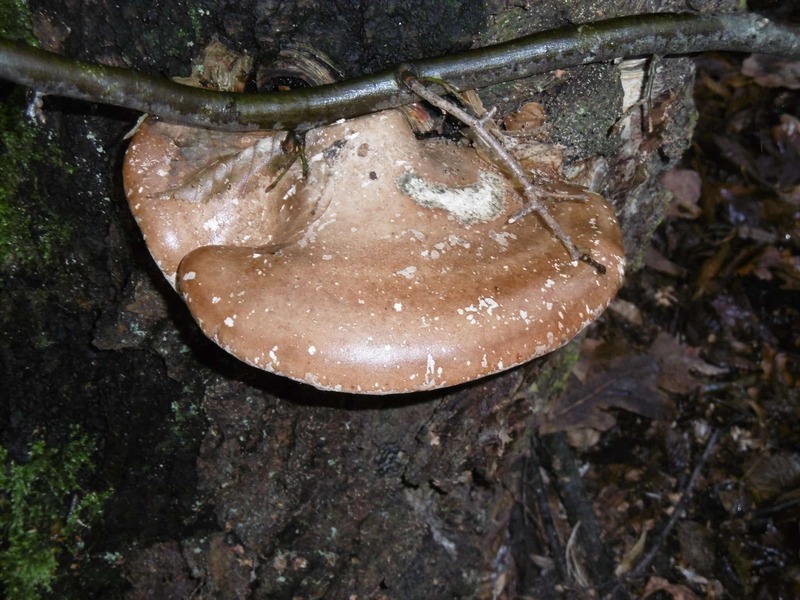 Fomitopsis betulina – recategorised in 2016 as studies suggested that the species was more closely related to Fomitopsis than to Piptoporus. Pitptoporus betulinus – Piptoporus comes from the latin meaning ‘pores cast down’ and betulinus from its host tree, the birch. It is also known as birch conk, birch bracket, and razor strop fungus. The razor strop comes from the fact that it has been used as a tool to get that final extra sharp edge on your knife, and has been used by barbers for their cut-throat razors. The name polypore refers to its many pores, situated on the underside of the fruiting body from which the spores are released. It is edible, but it has quite a bitter aftertaste so it’s not the most desirable for food, but it is not poisonous. Birch Polypore are brown on top, and white underneath with many spore holes. They grow on dead or dying Birch trees, and they erupt from the surface of the trunk. 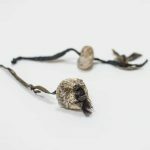 It has a rich, mushroomy smell, but opinions are divided on that – you’ll have to make up your own mind. I’ve also heard it said that infected trees smell strongly of green apples, but I have yet to experience that. 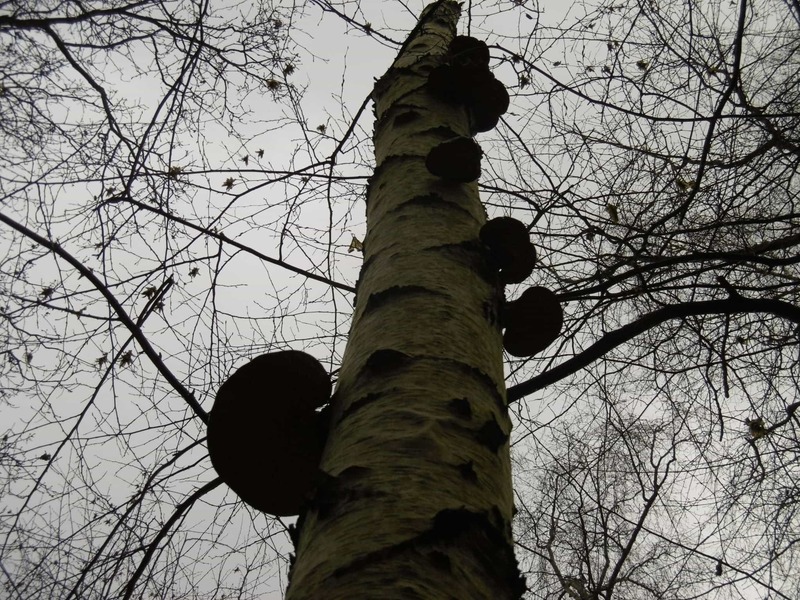 The birch polypore grows from a single lateral attachment point on birch trees, being a small white ball at first, then expanding to a bracket measuring approximately 10-20 cm across. It is white to begin with, the cap changing to a beige/tan colour and then darkening or greying with age. The underside is white and contains many pores which release their spores into the air. 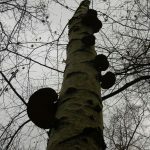 Spores land on exposed areas of birch trees, where branches have broken for example, and grow hyphae which spread to form the mycelial network through the tree. 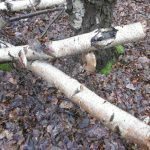 It is considered weakly parasitic on birch trees, a healthy tree will be able to contain the spreading hyphae; but in one that is aged or diseased the fungus will begin the gradual process of breaking it down. The fruiting bodies are annual, unlike some of our other common bracket fungi which may live for years, but they are often gnawed by insects before the end of this period so they are better picked young. 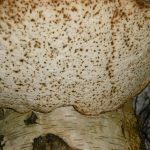 Birch polypore grows freely in the temperate forests of Europe and also North America and its ethno-botanic uses have been wide and varied. From medicine to tinder, knife sharpener and sweat band, this fungi has been employed in many more ways than your average mushroom. Like the more famous tinder fungus, Fomes fomentarius, it is able to carry a spark from one campsite another, easing the task of firelighting, and in more recent times it was cut into strips and used to sharpen knives, especially by those who could not afford leather, giving it its common name, the razor strop fungus. It became very well known after it was found on the body of Ötzi’, a 5300 year old mummy found preserved in the ice in the Italian Alps. Amongst his kit Ötzi’ carried two strips of hide onto which had been threaded pieces of birch polypore. 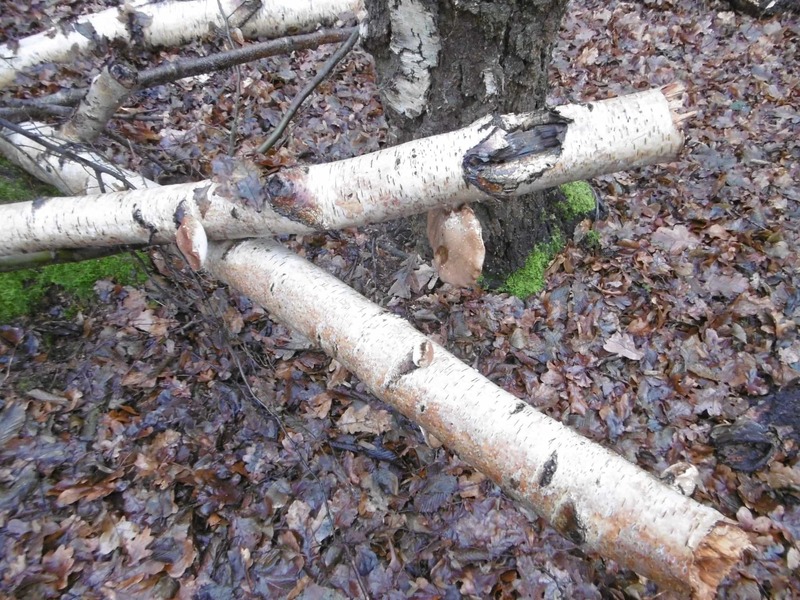 As he was later found at autopsy to be infected with intestinal parasites against which the birch polypore is active, it has been theorised that he was carrying them as treatment and also as a possible anti-septic incase of minor injuries. As I’ve already said, medicinally, this is an amazing polypore. Its properties as an anti-inflammatory, anti-septic, anti-bacterial and styptic properties alone make it really good for making a immune tonic or tea to be taken once a week to boost your immune system. 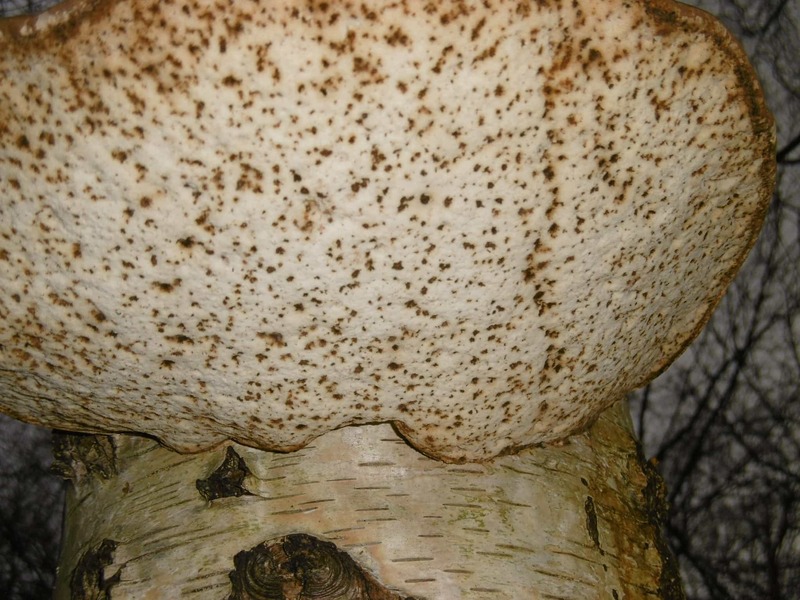 Birch polypore contains primary metabolites (polysaccharides) and secondary metabolites (such as triterpenes) that are beneficial for health. Research also backs up its traditional uses. However, research has also shown that the natural compounds in this fungus can be effective in fighting HIV and Cancer! Yes, really. (1) Another in vitro study on colorectal cancer showed that “Studied extracts highly decreased the viability of cancer cells, slightly inhibiting proliferation and tumor cell adhesion in a time- and dose-dependent manner.” (2) It also found that the extracts studied had very low toxicity to normal cells making it a safe and effective treatment. Mushrooms don’t keep for very long once you’ve picked them, so how you keep them is important. Drying is the best method to keep them for longer and have them still be useful. Once dried you can keep them in a paper bag, or a sealed jar in a dry place, out of direct sunlight. My favourite way of using Birch Polypores is in a tea, which can also be frozen so I’ll usually make up a load of it, and put some into ice cube trays to use in the future. Being a fungus, and not tea leaves, it’s not enough to put some pieces on hot water. Therefore, you need to put your fungus into gently simmering water for an hour. You can make 1 cup of tea/tonic with 6 to 8 grams of mushroom; So weigh your polypore pieces and adjust accordingly to make a batch. Sometimes, the taste can still be a little bitter, so why not freeze the extra into ice cubes. You can drop these into soups, stews, gravy etc. to disguise the taste but still get the health benefits. As well as a razor strop and sticking plaster, as mentioned earlier, apparently it has also been used for the fine polishing of metals, making ink blotters, and for mounting insect collections. One use that would have been important in ancient times, is that it takes a spark well, and can be used to carry fire over long distances. Therefore allowing people to move around without the hassle of fire-lighting from scratch. Lemieszek et al – Anticancer Effect of Fraction Isolated from Medicinal Birch Polypore Mushroom, Piptoporus betulinus – Int. Journal of Medicinal Mushrooms. 2009; 11(4): pages 351-364. Cyranka M et al –. Investigation of antiproliferative effect of ether and ethanol extracts of birch polypore medicinal mushroom, Piptoporus betulinus Int. Journal of Medicinal Mushrooms 2011;13(6): pages 525-33. Fulda S – Modulation of Apoptosis by Natural Products for Cancer Therapy -Planta Med 2010; 76(11): 1075-1079. Kanamoto T. et al –. Anti-human immunodeficiency virus activity of YI-FH 312 (a betulinic acid derivative), a novel compound blocking viral maturation –. Antimicrobial Agents and Chemotherapy 2001; 45(4): pages 1225-1230. Kawagishi H. – Novel hydroquinone as a matrix metallo-proteinase inhibitor from the mushroom, Piptoporus betulinus – Biosci Biotechnol Biochem. 2002; 66(12): pages -2748-2750. Kemani Wangun et al. – Anti-inflammatory and Anti-hyaluronate Lyase Activities of Lanostanoids from Piptoporus betulinus – The Journal of Antibiotics. 2004; 57 (11): pages 755-758. Kamo T. et al – Anti-inflammatory lanostane-type triterpene acids from Piptoporus betulinus – Journal Nat Prod 2003 66 (8): pages 1104-1106.